Today marks one year since my first bike ride to work. Since then I’ve covered over 3,700 miles, wearing out an entire drive-train in the process, and “enjoyed” pretty much every kind of weather Glasgow had to throw at me. I’m also a good bit fitter than I was 12 months ago, evidenced by the fact that today’s journey took almost 10 minutes less than that first one a year ago, despite being longer thanks to a few diversions. And yet, instead of celebrating what I’ve been able to do over the past year, my journey today had a very melancholy feeling about it. Don’t get me wrong, I’m very proud to have come so far (no pun intended… well, maybe a little bit) but my journey across the city passes by – and through – several of the Commonwealth Games venues, and it’s just not the same as it was last week. Take Glasgow Green for example. The pathways I normally use are still closed (hence the diversions) so instead of hugging the river I had to take the long way round, which took me past the entrance to what was the Live Zone, now sadly closed. The Ferris wheel, which we never rode on in the end, is still there, but it’s stationary, waiting to be dismantled and moved on to the next big event. I even caught a glimpse of the road events’ finish line, deserted and nothing like it was at the weekend. It was the same story along the Clydeside – what was bustling just a week ago was now virtually empty, returned back to normal just like the rest of the city. Even the buzz of riding the same Kelvingrove paths that the likes of Geraint Thomas, Peter Kennaugh, David Millar and Scott Thwaites did on Sunday was fleeting. I don’t think I’m alone in having the post-Games blues. I’m pretty sure loads of folk across the city are feeling the same way. There’s even a petition to have the official mascot, Clyde, adopted by the city, and made a permanent mascot, which I’ve signed. I almost shed a tear last night when I showed his farewell video to the kids. They absolutely loved him, and hearing Heather ask “where’s he going?” and “he’ll be back next year though, won’t he?” tugged on the old heartstrings even more than the video itself. 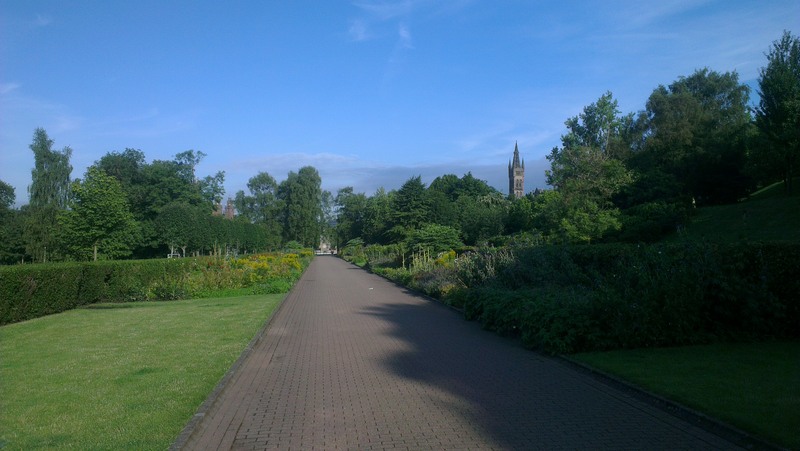 More positively, I think Glasgow has put on a great show for the world, and showed itself off as the fantastic city it is, and I’m sure the benefits of that will reaped for years to come – decades even. I’ve no idea what the next big event will be, but I’m confident that there will be one. And I, for one, can’t wait to do it all over again.